Editor’s Note: Guitarist Roger Placer recounts his introduction to ergo guitars and the lead up to his upcoming ergo acoustic guitar – custom built by luthier Chris Forshage. My interest in ergonomic guitars began in 2006, when I bought a headless Steinberger GM-7SA electric guitar on a whim. I unexpectedly found that, when seated, it was comfortable to cradle the guitar in the middle of my lap rather than resting it on my right leg. And when doing so, the neck pointed up at an angle, making access to the fretboard easier. The headless design also reduced the weight on the neck side, contributing to the ease of playing. I had never really considered these factors before, but now that I had the Steinberger as a case study, I felt like I had experienced a minor epiphany. However, nothing is perfect. The Steinberger neck is quite narrow, with a 1 5/8” nut. The tremolo hardware was not optimized for strings heavier than 10’s, and the tone is quite particular: modern, clean, bright, and bell-like. The solid maple body, while small, is also rather heavy. I thought it would be great to merge the headless design with a lighter instrument, perhaps a semi-hollow. And I wanted a fatter neck like my jazz guitars. So I began looking on the InterWeb for other headless instruments. I had known about Klein Electric guitars for a few years, having seen one played by Amanda Monaco at the National Guitar Summer Workshop’s Jazz Summit program. Also, I knew that David Torn played one. But I had never considered owning one. Now, it seemed to be the next natural step in the progression beyond Steinberger. As anyone interested in ergo guitars knows, Kleins are no longer made. Used ones are hard to find, and very expensive. Eventually my Googling on things Klein led me to the website of Joe Giglio, a New York City based jazz guitarist. Joe played a walnut headless with an f-hole and a Kleinesque lower profile (see Joe play this instrument on Embraceable You). It sat on his right leg in what looked like a very comfortable position. Copy on the website told me that the guitar was made by Chris Forshage, a luthier from the Austin, Texas area. An email inquiry to Joe produced additional photos of other Forshage headless guitars and a ringing recommendation for Chris’s work. Joe also played a more traditionally built Forshage archtop. In September 2006 I made initial contact with Chris and, after a suitable discussion on specs, work was begun on my “Ergo.” That is not an official name, but to my knowledge Chris has not formally named his creation, and everyone who orders one calls it that! Nine months later, in June 2007, my “Headless Tomato” was delivered. It fit me perfectly; great chunky bound neck, very light weight in the 6 lb range, effortlessly ergonomic for seated play. It was a revelation. I have owned about 80 guitars over the past two decades (and currently “stock” 30+), but to this day – three years later – the Forshage remains my top electric. I have experimented with pickups, and modified the electronics a bit, but the essential physical design of the instrument is unsurpassed for my style of playing. In July 2007, I produced a YouTube video demonstrating the Forshage, which as of February 2010 has been viewed over 22,000 times. Not bad for a video of an esoteric product serving a niche market! A handful of people have even written to me, letting me know that they had contacted Chris and commissioned an Ergo after discovering the video. Ironically, I shortly thereafter acquired a Klein Electric and found that it, while a truly wonderful guitar, has some of the same issues that my Steinberger had. The neck, in particular, feels silky smooth but is narrow. The sans truss rod design, combined with the TransTrem, requires light strings just like the Steinberger. The guitar is very expressive and excels for atmospheric and textural music, but does not have the tonal “girth” that I desire for my style of playing. Ergonomically, the Forshage body is actually a wee bit more comfortable even than the mythical Klein. The more gradually tapered bass bout of the Forshage – which is also a hair taller than the Klein – fits more snugly under the picking arm, and contributes to this. The guitar’s shape fits best when the player sits with a straightened spine, which of course promotes excellent posture and greater overall comfort. Near the end of 2007 I experienced, for personal reasons, an unexpected renaissance in my enthusiasm for acoustic guitar music. As I played my traditional steel and nylon stringed acoustic instruments, gradually improving my long-dormant acoustic chops, I began thinking about how the Forshage design might be married to an acoustic instrument. Here I was, temporarily eschewing my beloved ergonomic electric guitars, bending over large acoustic bodies to support and reach necks that protruded mostly parallel to the floor. But precedents for a headless, ergonomic, acoustic guitar were sparse to say the least (Bardophone, Koll). And none of them had all of the features I wanted. I envisioned flattop-inspired sustain and harmonic overtone characteristics, but with the “jazz personality” and adjustment friendliness of an archtop. I wanted a body with full 3-4” thickness and “real” acoustic tone. I also wanted a fat sounding magnetic jazz pickup, not the optimistic compromise of a piezo transducer, and simple controls that didn’t in any way dampen the acoustic response of the instrument. Most importantly, I wanted that lower body profile that is so perfect for playing seated. Initially, I wanted it to be headless. There was no single instrument out there that had all of these features. So In March 2008 I once again approached Chris Forshage with the idea, and he was enthusiastic to put his talents to the challenge. Initially, the plan was to use a figured redwood top, which is known for a hybrid nature that incorporates qualities of spruce and cedar. Chris had a set of Guatemalan rosewood that he felt would be fun to experiment with for the body. 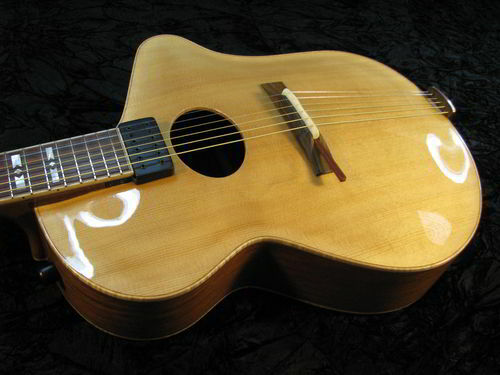 The body shape was drafted based on a Martin OM sized flattop with a traditional bass side, and a lower profile adapted from the electric Ergo. Chris produced a sketch showing the proposed acoustic body overlaying the existing Ergo shape. The result seemed to be a natural adaptation of a successful design for a new purpose. We planned to use a pinless bridge/saddle, and to anchor the string ends on an ABM tailpiece mounted on the tailblock. Chris suggested that he could remove the metal ABM housing and create a wood cover for it, to promote the more organic look appropriate for an acoustic. We planned to make the guitar a flattop with a round soundhole. Work commenced. Well, in reality, due to Chris’s work queue, not much progress was made for about 8 months. The back and sides were cut. The redwood top was bookmatched and set aside in his shop. At the 10 month mark (January 2009), Chris examined it and found that it had structural issues. He was not comfortable using it for the instrument. It was disappointing, but we started over with a spruce top. We also took the time to reconsider the entire premise of the instrument. We decided to scrap the headless idea and use a traditional headstock and tuners. This was partly due to availability of the ABM hardware, and also for aesthetic and setup reasons. Admittedly, after waiting so long only to basically start over, I was anxious to remove some of the more complex variables and make some progress with the build. With the move to a traditional tuning arrangement, I decided also to re-think the flattop concept. While I enjoy the tonal response of a flattop very much, I am an archtop guy at heart! Chris suggested an oval hole archtop, and I agreed. I had come to appreciate them, having owned two Eastman models of that type. An oval hole archtop already begins to expand the tonal response of the traditional f-hole type, so it seemed like a good base for experimentation. And Chris was, after all, an experienced archtop builder who had come to the Ergo model somewhat by happy accident. To ensure that the initial tonal goal of the project remained true, I requested that the top be carved and braced, and an appropriate bridge created, to accentuate flattop characteristics. I did not want another purely traditional archtop with a strong, midrange attack but limited dynamic range. And the idea was not completely unique: There were several luthier-built instruments on the market by that point, including the Ribbecke Halfling, that sought to merge archtop and flattop elements. Of course, none had the ergonomic profile that was the cornerstone of my desire. As is the case with any privately commissioned instrument, there are many small details to be worked out between luthier and client. Many of those are not too interesting or unique from an ergonomic perspective, so I’ll skip an exhaustive discussion. One thing about the Forshage “Ergocoustic” that I find appealing is that it is not a very radical design in most ways. The bass side is traditional. It has a normal multi-piece mahogany neck, tastefully inlaid cocobolo fingerboard, natural wood binding in all the expected places, and a modern but conventional headstock. The top is spruce and the back/sides are a variety of rosewood. There is a floating Kent Armstrong humbucking jazz pickup, as found on other makes of premium archtop, with a simple volume control leading to an endpin jack. There is no pickguard, however. I do think that pickguards look good, but they often add a “contraption” element to an otherwise sleek instrument. They can be a jumble of brackets, screws, protective padding, dangling wires, partially concealed controls, and dubiously attached pickups. They are fragile; they sag and sometimes fall off. I asked Chris to avoid all of that, and to attach the pickup to the neck in as unassuming a manner as possible. Additionally, to incorporate the pickup seamlessly, the soundhole is positioned farther down on the top than is typical. 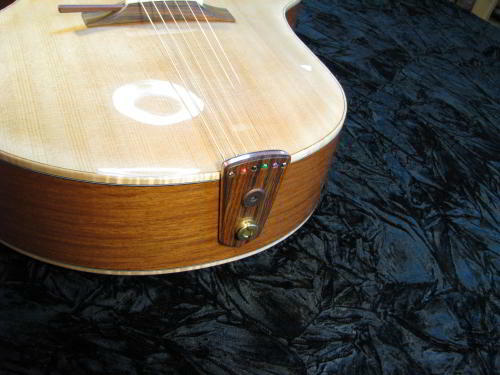 Normally, an oval hole acoustic guitar is built, and a pickup is later suspended from the neck (or pickguard) such that it overhangs right in the middle of the soundhole. Not only does that configuration appear as an unattractive afterthought, it probably affects sound – however subtly – and restricts access to the hole for maintenance or repairs. So the Ergocoustic was designed to do things differently. The bridge is a bit unique, being based on the D’Aquisto Accutone design with no adjustment posts, but having a shape reminiscent of a glued-on flattop bridge. There are two saddles, one made from bone and one from wood, for me to experiment with. The hope is that the bone saddle will elicit a more flattop tone from the guitar, while the wood will sound more traditionally archtop-like. Perhaps I will experiment with nickel flatwound strings as well as with 80/20 bronze. Chris can most likely elaborate on his motivation behind the bridge design, and on the unique “K” bracing pattern that he used for the top. The tailpiece started life as a typical wooden floater attached to the endpin with a loop. But it was quickly scrapped after what Chris humorously calls an “epic fail” during the first strings-on testing session! After some consideration, we went with a three piece laminate (wood/brass/wood) unit anchored at the tail of the guitar. This was inspired by luthier Erich Solomon’s Phidelity model, which coincidentally is also an oval hole archtop with minimalist design attributes. This tailpiece is functional and attractive, and provides a more rigid anchor point than the typical floating variety. I also hope that the lengthened string span between the saddle and tailpiece may lend some suppleness to the guitar’s playability. As of this writing, the Ergocoustic is nearly finished. It is buffed and awaits only final assembly and setup. In a second installment, I will continue the story with my impressions (and a video demo) of this promising instrument. For more on Roger, see previous coverage right here on BTEG and visit his homepage Rogerplacer.com. And stay tuned for the upcoming coverage of the Forshage Ergocoustic! My ergo interests also began with the Steinberger – in my case the Hohner model based on the original Steinberger broom shape. Like Roger, I found cradling it in the middle of my lap made a huge difference in my body position and comfort level. Made of maple, the instrument is quite heavy for its size and as Roger points out, these guitars have a very particular tone. What a fantastic instrument! What is the “lever” extending from underneath the saddle? Is it a prototype remnant or a permanent feature? Hi Ola, that is a height (action) adjuster for the saddle. It’s based on Jimmy D’Aquisto’s “Accutone” bridge design, which removes moving metal parts from the traditional archtop bridge apparatus. I actually have this guitar now (!) and will definitely record a demo video when we have become better acquainted. Also, Chris was kind enough to provide me with a wooden saddle in addition to the bone one that’s on the guitar now. Wonderful instrument ! Can we see some more pictures please ? I for one would be most grateful. Congratulations. This looks great! I’ve been thinking about ergonomic acoustics, too, and am looking forward to seeing and hearing your demo. Forshage does beautiful work. Wow, interesting, Roger. Can’t wait to see it in action, too. How come it’s not orange?? I must say, the guitar is very versatile and I need to explore it and share some of the different tones it’s capable of. I have swapped the two bridges (bone and wood) back and forth, and right now I’m digging the wood. I always gravitate toward a warm jazz tone, and the wood gets it even at the expense of some acoustic volume vs. the bone. Let’s just say that Mr. Forshage knows how to build an archtop. He just happened to make me a funky looking one that does the ergo thing. At least that’s one way to look at it. I have a Part II to this “first take” underway that is probably verbose enough for even the most masochistic among you all. It discusses the reality of what the instrument actually is, vs. the vision of what it might be (Part I). Thank you all for the interest (I don’t take it for granted). Cool looking guitar, thanks for sharing the story. Can’t wait to hear it! It’s so great when there’s a guy who can dream and a luthier who can follow that dream. Cheers to you both! I just wanted to let BTEG readers know that I now have 3 videos on my U-Toob page (rpguitar) with this instrument. The one entitled “Quick Take” features mostly single note improvisation to a jazzy groove. I’m using the cocobolo wood saddle on that one. The “Demo” is narrated and on this I have the bone saddle installed. Finally, on “Mark on the World” I play an original song, flatpicked, with the wood saddle again. Check out the tonal differences. Despite these 3 examples, I don’t feel that the guitar has spoken yet. More to come, hopefully with increasingly interesting musical content as well. Just checked out the videos — excellent! Very nice, open sound; it’ll be interesting to hear how the guitar evolves. Chris does wonders. Thanks for posting this Roger. I’m one of those you mentioned who were prompted to contact Chris after seeing your demo of the ergo on youtube… got to be careful not to be tempted into an ergoacoustic now. Your newest acquisition looks fantastic and I really admire your willingness to experiment. Your reviews, both here and on youtube, are, as always, great. All the best to you and Chris. Thank you for the kind words, Marc. Experimentation is something I enjoy. When the experiment yields fruit it’s very satisfying. The key axiom to follow is “be careful what you ask for.” Because when you’re paying for it, you’ll likely get it, even if it’s a stupid thing to ask for. 🙂 I had several kooky ideas during the gestation of this creature that I wisely recanted. I’m happy with the way it landed. Stunning guitar Roger, Chris as usual did an incredible job, I love looking at the blend of ergonomics with the acoustic world. Great looking guitar! I am sure it plays and sounds like a dream. I have found that the tailpiece works perfectly on the smaller bodies. Happy to see the design picked up and used by an outstanding luthier!! Best to you, Roger and to Chris and thanks for giving fair credit to me for the tailpiece design, much appreciated. By planning dimensions perfectly, one could even influence the pitches of the strings when plucked open between bridge and tailpiece. On my guitar they are quite out of tune with fretted notes, so I ended up muting them with a piece of yarn to eliminate off-sounding overtones. Your work is beautiful Erich. Thanks for looking! Great looking guitar Roger. I’ve been influenced by the Erich Solomon style tailpiece for my next build and have been contemplating getting those overtones tuned. Are the overtones in tune with open notes or they just don’t consist of any of the 12 notes in our western music? I haven’t had the opportunity to experiment yet but I’m just wondering if the wolf notes when that section of the string is tuned will ever sound good with all the notes possible, or just notes in certain scales since it seems you’ll always get the same overtones for each string regardless of the fretted note. Is it even something noticeable I should be spending time with? Any info would be great. And btw: The youtube vid of you playing was what got me! Sounds amazing!! !